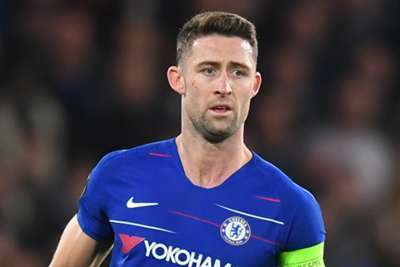 Gary Cahill lacks the technical ability to break into Chelsea's team, according to head coach Maurizio Sarri, who admitted the 32-year-old will likely have to leave the club to find first-team football. Sarri has not selected Cahill to start in the Premier League so far this season and the defender is in the final year of his contract at Stamford Bridge. The situation has led to speculation linking Cahill with a move to Arsenal in the January transfer window, and Sarri did not deny that the England international's time at Chelsea could be coming to an end. "I respect him very much because he has won everything with this club," Sarri told reporters. "I have to do my job. Every match, I have to choose. For me, he is not able to [be] on the bench. Cahill joined from Bolton Wanderers in January 2012 and has helped the London club win the Premier League title twice, as well as the Champions League in 2012 and the Europa League the following year. He has also lifted the FA Cup twice and the League Cup during his time with Chelsea, yet Sarri made clear the club does not tend to offer long-term deals to players over 30. "He is in the last year of the contract," said Sarri. "He has to decide for a new contract here or another club. "For the over 30 [players] the club usually offers only one-year contracts. If he has an offer of three years, he can of course choose something [a transfer away from Chelsea]. "It doesn't depend if I am sentimental or not."